The Lexus GS is a lineup of mid-size performance cars from the Japanese luxury brand. The car was originally sold as the Toyota Aristo from 1991 to 2004, but only in the vehicle’s domestic market of Japan. When Toyota expanded its lineup of Lexus brand vehicles, the Aristo was moved into the luxury family and the name was changed to represent “Grand Sedan.” Lexus has sold four generations of the GS since 1993, which were originally six-cylinder, rear-wheel-drive vehicles. Later in the series’ lineup, for the second and third generations, Lexus added a V8 powertrain option. In 2005, Lexus added an all-wheel-drive configuration and, perhaps more importantly, a hybrid drivetrain, tapping parent company Toyota’s years of expertise in gasoline-electric hybrid technology. The first generation of the Lexus GS series was available in the United States, as well as selected markets in Europe and Asia. It was replaced by the second generation in 1997, which lasted until 2005. The third generation Lexus GS was released for the 2006 model year, and was notable for its first-time availability in Japan as well as its expanded drivetrain lineup, which featured the Lexus GS 450h. The new hybrid version of the GS was revealed at the New York International Auto Show in 2005, and didn’t actually go on sale until the generation was already underway, for the 2007 model year. The Lexus GS 450h, the most expensive car in the GS lineup, was the first rear-wheel-drive hybrid vehicle from a luxury manufacturer to be mass produced. The hybrid drivetrain in the 2007 Lexus GS 450h was powered by the Lexus Hybrid Drive system, and consisted of a 3.5-liter V6 gasoline engine paired to an electric motor, complemented by a continuously variable transmission. The drivetrain yielded a combined 339 horsepower with a 0-60 acceleration time of 5.2 seconds. 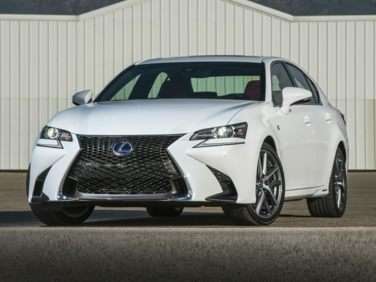 The third generation Lexus GS 450h could be equipped with features such as electric power steering, variable gear ratio steering, adaptive headlights, an electronically controlled brake-by-wire system, and an automatic adaptive suspension system. Safety equipment on the Lexus GS 450h consisted of a comprehensive airbag system that included knee airbags and front seat side torso airbags, electronic brake force distribution, anti-lock brakes, brake assist, electronic stability control, an infrared driver monitoring system, and an optional radar-based pre-collision system that prepared the vehicle for the impact of an impending crash. The interior of the GS 450h featured heated leather front seats with power and memory functions, keyless entry and ignition, a seven-inch touchscreen display, ambient LED cabin lighting, a power moonroof, a surround sound 14-speaker audio system, satellite radio, DVD navigation, a rear view camera, and Bluetooh wireless integration. The Lexus GS 450h was also included in the lineup of the fourth generation of the GS, which was introduced in the summer of 2011 at the Pebble Beach Concurs D’Elegance in California and was rolled out for sale across its global markets in spring of 2012. New styling cues included the LED front and rear lights on the exterior, and a redesigned cockpit that replaced the touchscreen with a mouse controller system. Many options and features carried over from the third generation. The drivetrain in the GS 450, still based on a 3.5-liter V6, lost a single horsepower from its output but achieved fuel economy increases of about 35 percent. For the 2013 model year, the GS lineup also got a less powerful hybrid option, the Lexus GS 300h, although it will not be exported to the United States.